For expanding your business and outreach to more customers building up a social media presence is not only essential but simply inevitable. 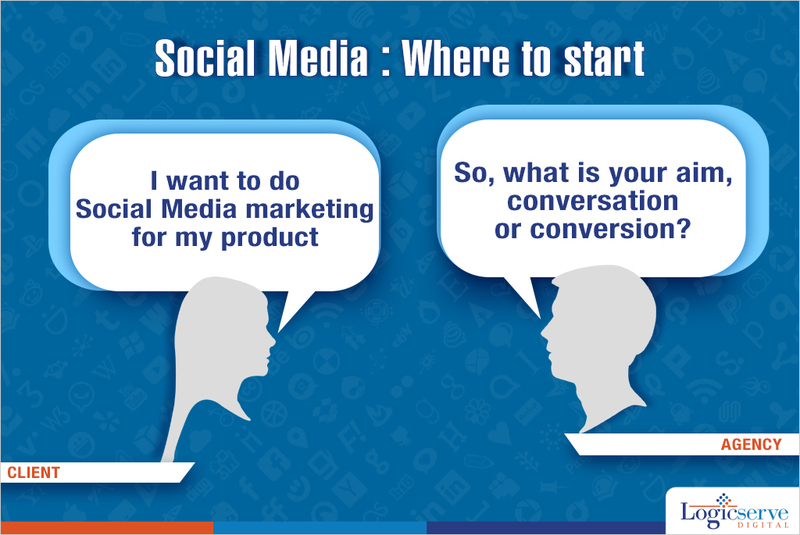 Surely, social media must have been a hot topic discussed in your business circles in recent times. When you have multiple channels such as Facebook, Twitter and Pinterest and each of them having a definite style of promotion, Business promotion, advertising, marketing is certainly not a piece of cake. Facebook – The most popular hub where people meet, relate and discover long lost friends and colleagues. Facebook has gone ahead to target its users by displaying relevant ads. Not only this, Facebook apps prove to offer some of the best marketing tools for driving in traffic. Facebook is usually the first place to begin advertising and marketing on, because it is accessed multiple times 24×7 ensuring good deals enjoy a high degree of visibility. 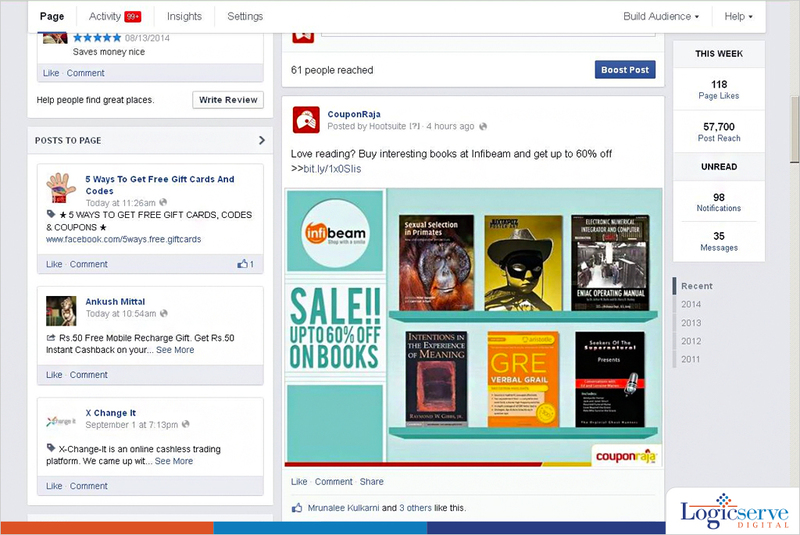 An attractive Facebook post announcing massive discounts on books online is how Couponraja, a premier coupon aggregator promotes a merchant offer across its followers. Pinterest – A very engaging social media platform offering visual treats. Known to be quite impactful for viewers who shun away from reading blocks of text, Pinterest is known for its high engagement ratio. 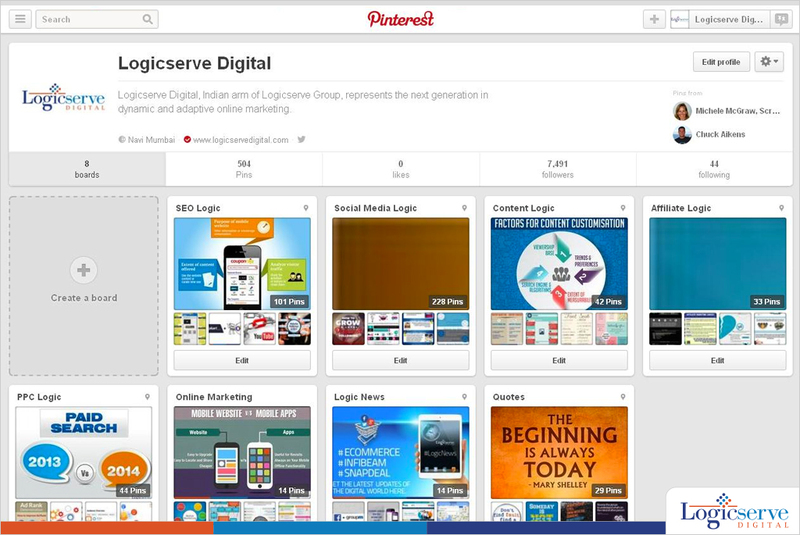 The Pinterest board of Logicserve Digital, a digital marketing agency in India has multiple category specific boards through which it has been successful to engage many of its followers. Twitter – The most crisp and concise marketing platform catering to your outreach. A short tweet of just 140 characters which can now be embedded with images, multimedia content and more through Twitter Cards does evolve into a powerful marketing tool for most brands. 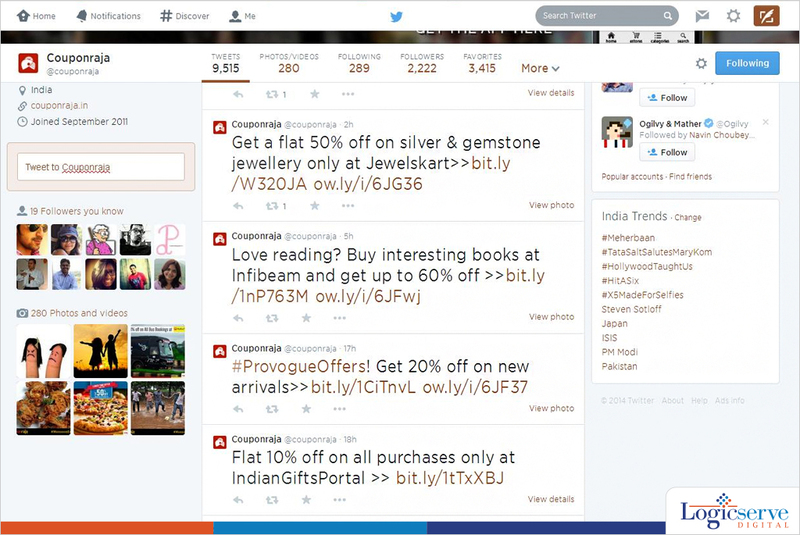 CouponRaja’s Twitter handle tweets the most promising deals and offers across most popular categories for its followers to take advantage of. Business promotion through online is inevitable but at the same time, this platform is evolving very rapidly. Instead of just jumping on to the bandwagon, it is best to embark steadily in a planned and phased out manner across each of them while being very consistent at the same time. Over the time with your brand identity established online and stable audience, you will be able to experiment in a better way across these social media platforms.